A fearful and dedicated reader of The Fear Beneath sent in these EXCLUSIVE and graphic images from the coast of the Bixby Ranch, in Northern Santa Barbara County. 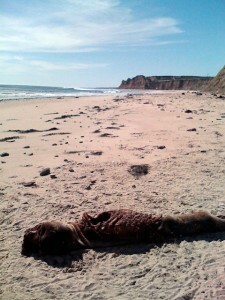 The images depict the badly decomposing and scavenged carcass of a seal, common local sea life in Santa Barbara County and a favorite snack of sharks, due to the energy-rich fatty flesh of the pinniped. Filed Under: California, News, Shark Attack Victims Tagged With: Another dead pinniped litters the Bixby Ranch coastline, bixby serial-seal-killer strikes again, Northern Santa Barbara County - Shark Attack Capital of California?